The game invites its players to a fun journey, using a map and a set o playing cards. The map covers the game area and provides historical information and iconic elements of the Citadel. The cards are an interactive photographic archive of the historical area, and are ranked from easy to very hard. The game begins at the start point marked X, all the registered teams receive 5-6 cards and the game begins when all the teams have received the maps and the cards. The purpose of the game is to find as many places shown on the photo cards as possible within the time limit of 45 minutes. The objectives can be marked on the map or photographed from a similar angle, as shown on the card. The winner is the team that gathered all the cards in the shortest time or has collected more cards than the competing teams. To have the result registered, the team must go to the exit point on the map. The game can be played by both citizens and tourists but it can be played by childrens as well. In this regard we have organized a gaming session with children from different schools within the city. The groups of children came together with their teachers ready to explore the city transforming this experience in a vivid history class. The game is a tool for activating the interest in the rapidly changing neighbourhoods and their stories, and encouraging citizen participation in gathering the valuable empirical data on the material culture of the changing neighbourhood. 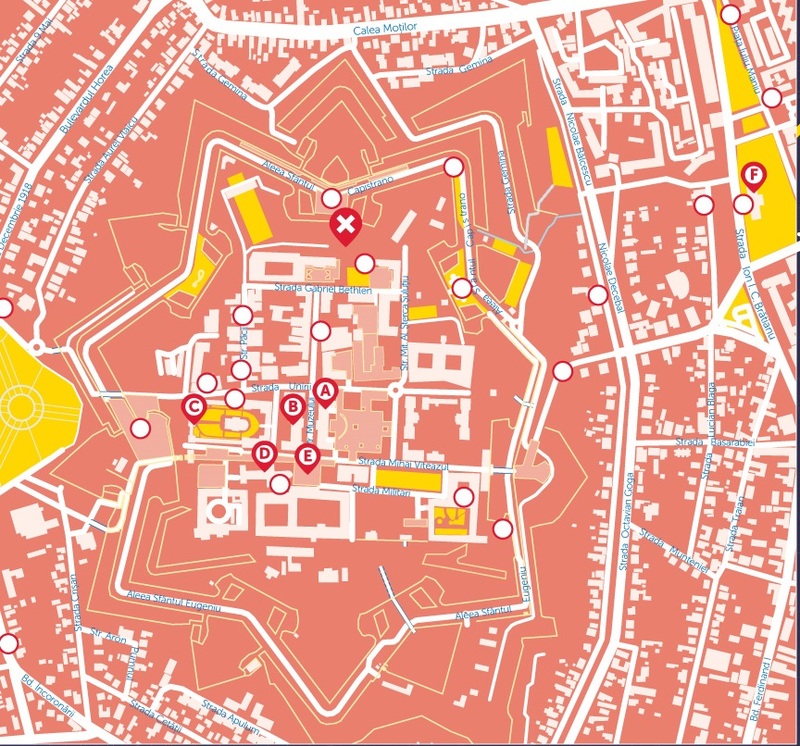 It invites you to explore and discover the unseen part of cities using a map and a package of playing cards. "Everyone can play Urbingo Centenar, the purpose of the game is to discover a different city, to discover some details that you usually overlook. Many times when we stroll along, our eyes follow a certain line of sight, but this game forces you to look down or up to the roofs," Carolina Creative Quarter member Ioana Mladin. So did Urban Centenar players on an autumn day (25th November), from the youngest participants, classmates from an Alba Iulia primary school, to teens and adults who wanted to discover the city differently. They had a seven-card demo version, compared with the full version of 21 playing cards. Eight fourth graders divided into four groups and equipped with a map and seven photo playing cards had one hour to discover the real-life details depicted in the photos. First to finish, Andrei and Larisa, had only one game card that they misplaced in space. "We generally participate in all the activities that take us outdoors and help us develop our physical orientation, get to know our city better, and get to know each other better, working as a team. All these games are constructive for children and, why not, and for adults as well. It's something exciting, discovering landmarks is a real adventure to," said Viorica Rusu, the children's teacher. The game for three adolescents passing daily through the Alba Carolina Fortress on their way home to high school was not a tough one, as they finished the race in the shortest possible time, and their reward was the full version of Urbingo Centenar. "It was not hard to us, but it is very interesting to visitors if they want to explore the city, to visit all these landmarks and also to play," said Florin Drambarean, 16. His friend, Adrian Mermezan, concurred, saying this is a "very good" game for tourists. "The idea is excellent, especially because there are many people who come to Alba Iulia only to visit the fortress. There are many landmarks outside the fortress worth visiting; there are some houses in a different style from the contemporary one. This is a game that stimulates you to go exploring in particular, because it is much more fun to do it this way than to just walk and to wonder when you see something. When you have a goal, you are always encouraged to be more careful about certain details," said Ianis Misios, a 17-year-old. The game was easy for Monica and Edina as well, two local girls, but they said, there were times when they had doubts about certain details. "We had to study them carefully, because we definitely wanted to win," Monica said.